As part of the Carbon Capture and Storage (CCS) project led by Equinor and partners Shell and Total, Deltamarin has signed a contract to support the energy majors in LCO2 vessel design and environmental optimisation. CCS will be an essential part of reducing carbon emissions and reaching global climate targets. The environmental optimisation FEED study includes evaluation of technology related to energy efficiency and reduction of the environmental footprint of the LCO2 carrier type of vessels. Various technologies including Carbon Capture technologies, fuel cells, zero emission and low-carbon fuels will be investigated and measured by Deltamarin’s Energy and Environmental Efficiency (EEE) simulation model. “These types of developments are setting new trends for global climate solutions and maritime transport. Naturally we are extremely happy to participate in such a pioneering project and to make our energy efficiency and optimisation expertise available for Equinor and partners,” says Deltamarin’s Sales Manager, Jaakko Lappi. The storage project is part of the Norwegian authorities’ efforts to develop full-scale carbon capture and storage in Norway. 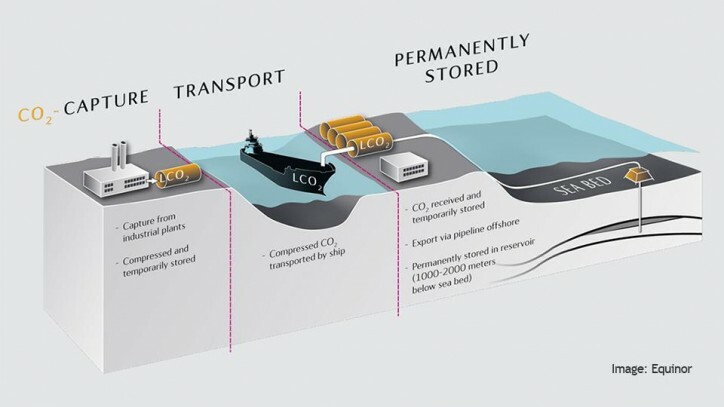 It will capture CO2 from onshore industrial facilities in mainland Norway and transport CO2 by ship from the capture area to a receiving plant onshore located on the west coast of Norway. At the receiving plant, CO2 will be pumped over from the ship to tanks onshore, prior to being sent through pipelines on the seabed to injection wells on the Norwegian continental shelf (NCS).